… increase the RESPECT LEVEL urgently needed in senior residences, particularly long-term (nursing) homes, to more effectively manage and protect residents’ very expensive hearing aids and eyewear necessary for their everyday quality of life … before bringing Dad’s new replacement hearing aid and glasses into his long-term care residence. That’s all for the blog today because I have lots of other writing to do … including for the above. Have a good night. And thanks for dropping by! I used to believe this too, though now I call this thinking a fallacy because of a question that arose … does this kind of thinking empower us to make our world and the world-at-large a better place so we all thrive? Or are we just continuing to accept this hand-me-down mentality and passing its limitations onto the next generations? After considering this mindset extensively I realize this perspective is yet another deception the Disrespect Philosophy creates to keep us small, with little expectation or hope, repeating the past over and over, instead of empowering us to create significant lasting personal and cultural change. I will give you my scenario and hopefully as you read this, you will consider yours … from both perspectives. For years I thought all the very limiting and negative experiences my life was filled with were my fault … including the abuses I experienced as a child … for being misunderstood, different, pre-judged, starving for acceptance and as a result, vulnerable to people who prey, consciously or not, on the vulnerability of the broken-hearted and the broken-spirited with promises that eventually caused me great harm … the dangerous kind of harm that reduces a child’s, a youth’s, an adult’s RESPECT LEVEL to such a low-level one keeps attracting the same level of disrespect from others … reinforcing and reducing one’s RESPECT LEVEL that turns what started out to be a happy, loving being into a negative, frightened being who seeks to hurt first in relationships or runs away or uses habits as distractions. For now I see through this veil of deception imprisoning most of us. For in truth, if we lived in a global culture of “Respect for all life,” based on The RESPECT PRINCIPLE, we would bring children into a world where we would have made the “Respect Full” changes to ensure all children would not have to qualify or be approved of in order to receive healthy food, shelter, clothing, medicine, education and if not love, at least RESPECT, the simple recognition that they, as the unique individuals they are, are valued … are valuable … just for being who they are. In my case, if my parents, family, school, community, province and country had a high enough RESPECT LEVEL for those more different from themselves, they would have sought to discover what personality type I was, what were my primary and secondary communicating and learning styles, what type of learning environment I needed to develop my own identity, boundaries and a healthy RESPECT LEVEL for myself, and as a result, for others, thereby developing to the best ability the social skills to interact well with the world in all my relationships. But they did not know my personality type thrives on study, research, exploration and then lots of analysis, introspection, problem solving, and creativity. They did not know my personality type’s mind receives vast internal stimulation whereas the majority of people require external stimulation from the world around them to keep them engaged mentally and that when I am in the external world too long, I shutdown to protect myself. But of course, the irony is, shutting down and withdrawing from those people whose brains require vast external stimulation often, because of ignorance, misjudge and mistreat those who withdraw, often taking their withdrawal personally, which ultimately puts those trying to protect themselves in more danger. They did not know how their ignorance and their demand for 100% conformity broke my heart and my spirit as well as contributed to the harm to my body … inflicted by others and my self because of my low RESPECT LEVEL for myself. And this is where many people will say, “But look at what you have learned, who you have become … a writer, author, advocate and so much more,” but I say this now, “But look at how much more I could have given to the world, at what a better citizen, student, role model, wife, daughter, sister, friend, supporter, community member I could have been all my life … if I knew from experience I was valued and aided accordingly for who I was and for my unique gifts, talents and abilities. I tell you who I would have been, what I would have done, the life I would have lived … I would have been placed in a Montessori school where self-directed education is best suited for my personality type. I would have received an athletic scholarship for the physical prowess and stamina I inherited from both of my parents. Because of my natural desire to study, I would have a few degrees, would be a lifelong successful author, an altruistic entrepreneur and so much more. I would not have married twice because I would have made better choices for me because I would have known myself better and not tried to get my value through other people whether in relationships or work I did. I would have been more respectful of others … their feelings, their things and I would have enjoyed happier and healthier relationships with my family. Though this is my story, this is also everyone’s story … just look at our world. Now that my years of study, research, analysis and problem-solving have revealed the lies and deceptions for what they are, now I am being who I was destined to be, doing what I was destined to do, life is good and my life will one day reflect that good … but if I had grown up in a world with a higher RESPECT LEVEL, my whole life would have bore the fruit of being who I really am … all my life and not just in the last half of my life … and the world I was in contact with during my lifetime would have been better for that experience. If I could, I would change almost everything about my life, starting with my early years, where in photos I find a happy, joyful, exuberant child ready to explore the world, but since I cannot do it over for me, I am dedicated to shedding the light on the darkness … on the lies and deceptions the Disrespect Philosophy, the Enemy have used to hold us as prisoners. I hope and pray you will too … it is never too late to be who you are meant to be. Karma, Reaping What We Sow or Lifetime Prisoners to Disrespect Philosophy Thinking? What if what is accepted as karma … getting back what you gave … reaping what you sow … really is a fallacy based on the Disrespect Philosophy, the premise no one or nothing is valuable unless some one or some group says so? Not that I am suggesting karma or reaping what you sow does not happen … spiritually and scientifically, both are proven by research and personal experience, my own included. What I am asking us all to reconsider is the long-term effect of believing as we do instead of recognizing that living in a world driven by the unconscious belief, the Disrespect Philosophy, we may experience karma or reaping what we sow … repeatedly, because when we don’t change our negative belief about the karma or what we reaped as only an effect … a temporary one … we become prisoners of such thinking and will continue to experience over and over and over the same karma … the same reaping … which will reinforce our negative thinking and the negative thinking and judgment of others about us … thereby constantly reinforcing the Disrespect Philosophy that keeps individuals, families, communities, cultures and nations, including our global nation, prisoners of a core belief that has imprisoned us, as history shows, for centuries. Breaking free results from becoming aware of what one’s core beliefs are … as reflected by the results we generate … and then doing our work to change our thinking to generate new results by new actions … breaking the karmic and harvesting cycle of what we once sowed to reap the benefits of our new seeds. The majority of us are driven by what has been driving humanity since the beginning of time whether you look at it from a spiritual perspective or from a rationale, intellectual, scientific perspective. The Bible calls Satan the deceiver … one who lies about who people are as children of God. 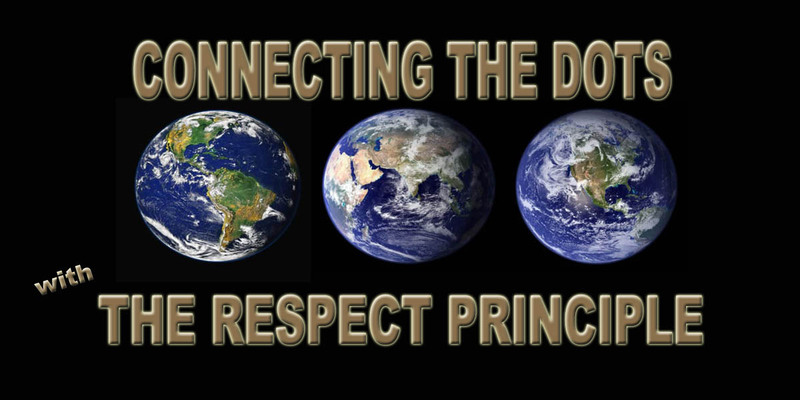 The deceiver from a scientific, intellectual rationale perspective I call the Disrespect Philosophy, which as humankind’s history and presence show, we are to treat no one with respect unless we or someone else has decided such a person or group is worthy of being respected … valued. The opposite, empowering, compassionate as well as logical and practical rationale is the Respect Philosophy, which I renamed as The RESPECT PRINCIPLE simply because a principle means a foundational or core belief. Recognizing the results we and the world generate based on our global unconscious belief is the first step. Raising one’s personal RESPECT LEVEL is the next step because when our own RESPECT LEVEL rises, as I have experienced firsthand, so do results we then generate, reflect our reaping new growth, breaking free of the karma from the negative thinking that has shaped our lives. We all fall down because we all make mistakes … that is if we are living, taking chances and risks to keep learning and growing … which means sometimes we fall or fail. The Disrespect Philosophy or Satan, whatever your belief, will do their best to keep you down and imprisoned till what’s left of your life is but a shadow of what we can become … and I believe with all my heart that most of us are so much more than what we have come to believe … regardless of the how and why. Today, I say to you … you are so much more. I know this because I have been a prisoner of a low RESPECT LEVEL for most of my life … valuing other people more than myself, putting their needs first … but I firmly believe we are all valuable in our own unique ways and that when we discover what those ways are, we create the best life for our self and therefore have our best self to share with the world … and that together, there is nothing that will stop us from finally breaking free so we can create a better world … the likes of which has not yet been seen in humanity’s time. So, what is holding you prisoner? Or are you one of the fortunate few already free? Regardless, bravo to you, for making the changes you need to be who you are destined to be! All Rights Reserved by DARK HORSES PRODUCTIONS/KAITLIN A. TREPANIER, Getting YOU the RESPECT YOU Want … Connecting the Dots … with The RESPECT PRINCIPLE Developer, Author, Speaker, Playwright, Altruistic Entrepreneur, and Human Rights Activist <strong … because every child … every person … should know, by their own experience, they are valued … RESPECTED.